A boy in a Santa Claus suit with his family in a street side cafe in Hanoi. 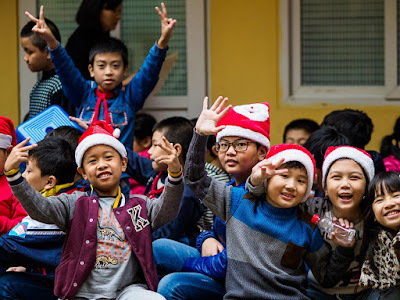 We went to Hanoi for the holidays. 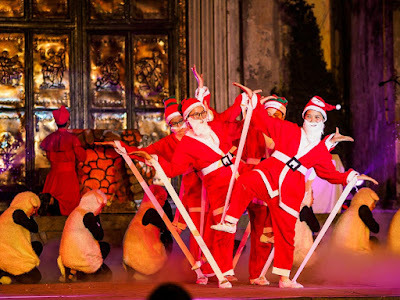 It might seem an odd choice, Christmas under Communism, because Communists are, allegedly, atheist. The truth is though, Vietnam is no longer communist. It is, absolutely, a one party state. But communist? No. 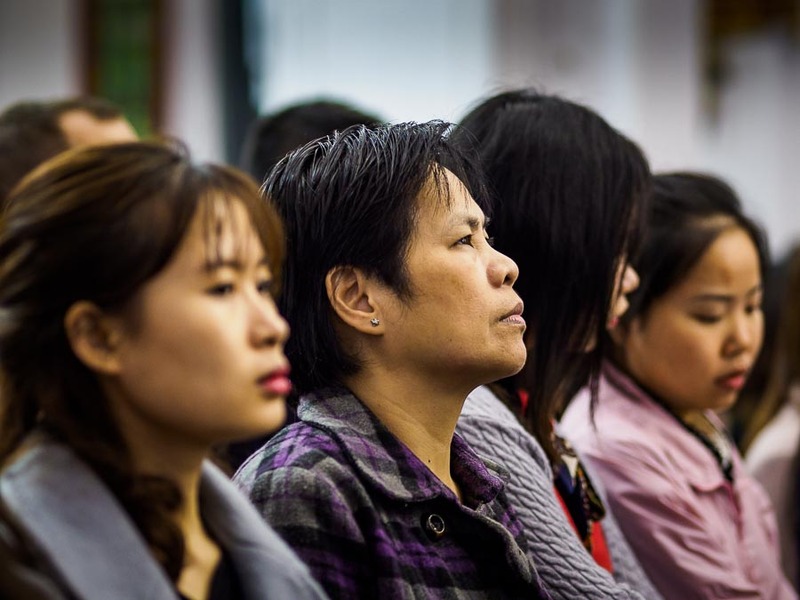 Since adapting market reforms in the 1990s, Vietnam, like China, is runaway capitalist. 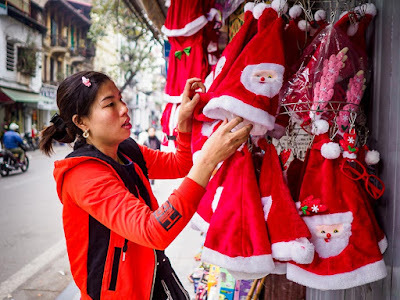 A vender sets up Santa hats for sale on a street in Hanoi. 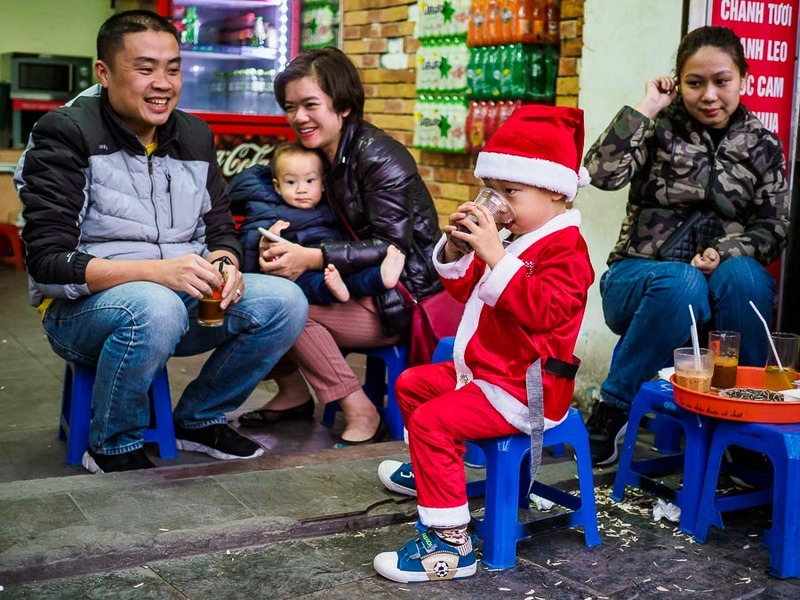 For years, we've celebrated Christmas in Bangkok, which although majority Buddhist, has huge Christmas celebrations. This year, we decided to go to Hanoi because we haven't been there in a couple of years and because it's much colder than Bangkok and we wanted a little weather break. Public school children at their school holiday party. If you think there's a "War on Christmas," you need to drag your head out of the FOX News / GOP bubble and tune into the world. It is, without doubt the most widely celebrated holiday in the world. And claims of a "War on Christmas" only serves to divide people. Christmas carolers perform in front of St. Joseph's Cathedral in Hanoi. It was one of the first large buildings constructed by French colonial authorities in the mid 1880s. 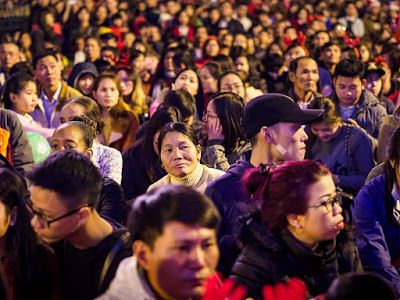 St. Joseph's serves as the center of Hanoi's Christmas celebrations. Hanoi's Christmas is a thing to behold. Entire streets in the city's historic Old Quarter turn into a vast Christmas bazaar with shops selling nothing but Christmas kitsch. 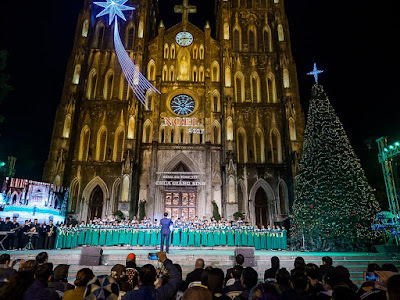 The Cathedral hosts multiple Christmas events for days before Christmas. 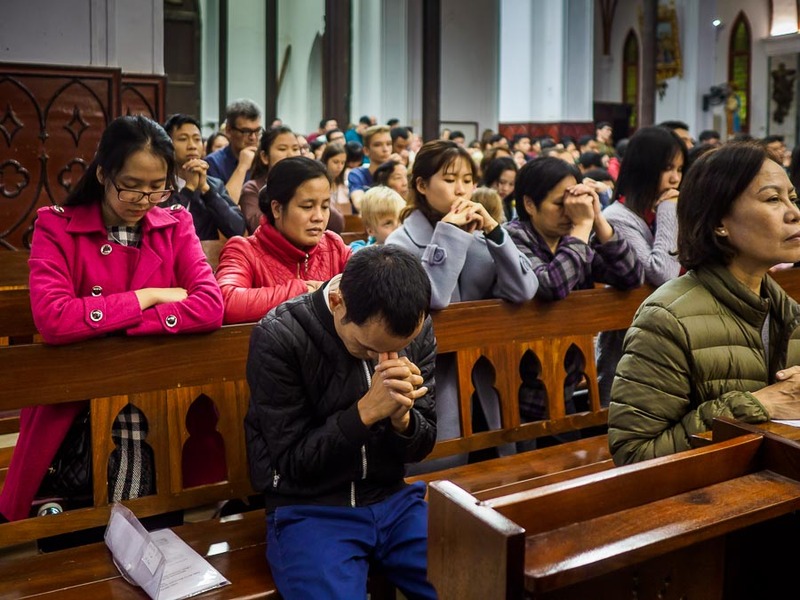 Pageants, carolers, and masses in Vietnamese, English and French (we went to the French Christmas mass). Parents put their kids in Santa suits. 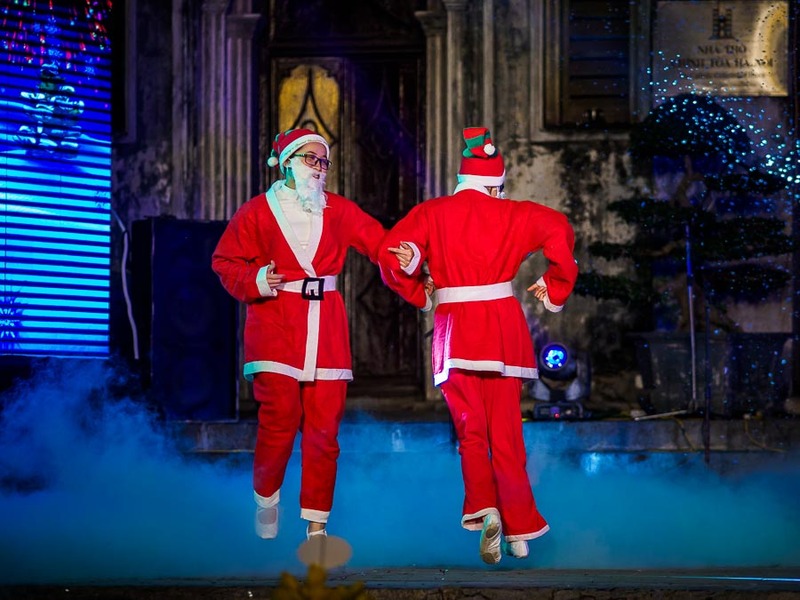 Teenagers and young people don Santa suits of their own. Cans of fake snow are sold to create a European Christmas atmosphere. Women stand in a blizzard of snow in can during one of the Christmas celebrations in front of the Cathedral. 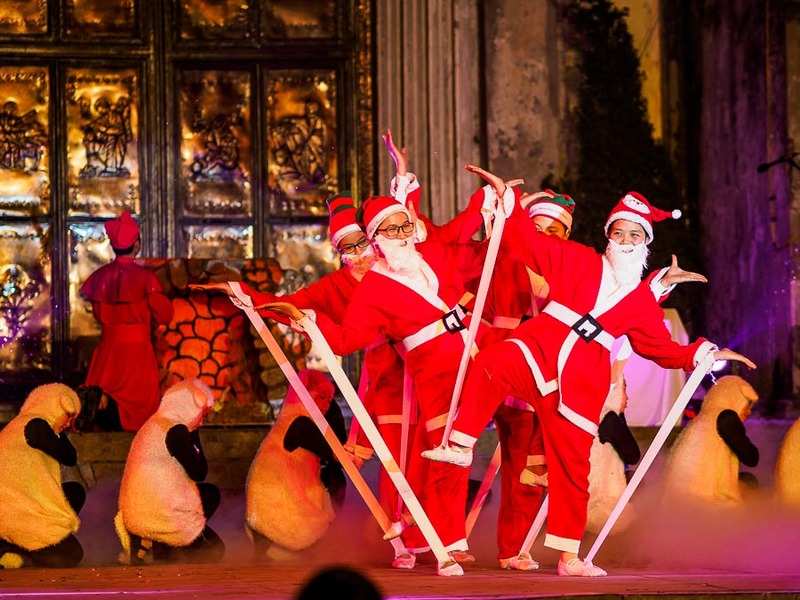 Dancing Santas during a show in front of the Cathedral. 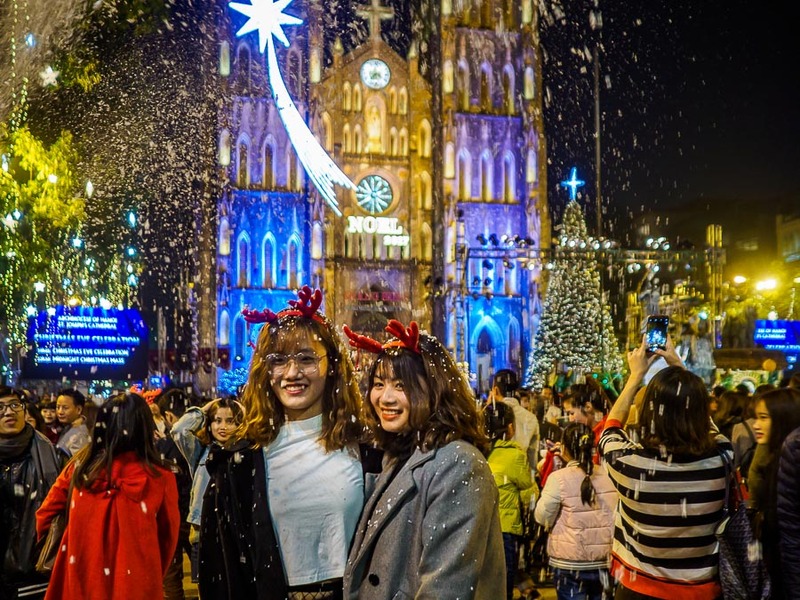 Just like the US, it's mostly the commercial aspect of Christmas, but the spiritual aspect of Christmas is widely celebrated in Vietnam. Vietnam has a large Catholic population, the fourth largest in Southeast Asia (a legacy of French colonialism) and the churches are packed for Christmas. The French service we went to was packed to beyond standing room and thousands of people crowded into the plaza in front of the cathedral for midnight mass. At the French language Christmas mass in the Cathedral. The crowd on the plaza in front of the Cathedral before midnight mass. Christmas is a great time to be in Hanoi. It's much colder than most places in Southeast Asia. (Although this is relative. We're talking overnight lows in the 50s and daytime highs in the 60s. Summer weather in Minnesota.) Gray and overcast with frequent rain. And relatively short days. And I mean that in the best ways possible. If you're from Europe or the Americas and used to seasons and early evenings common to those regions, Hanoi feels more "Christmassy" than Bangkok or Singapore. A family near Hoan Kiem Lake in the Old Quarter of Hanoi. No lack of Christmas spirit here. 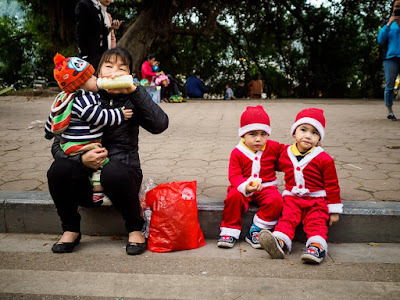 There are more photos of Christmas in Hanoi in my archive or available from ZUMA Press.